On the eve of October 27, 2015, I was surprised by my wife, Stephanie Yvette with a very fabulous gift. 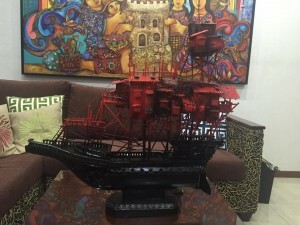 It as a Sculpture entitled Balangay (a large boat of the Philippines) by the famous Aris BAgtas. The sculpture was personally delivered by Aris Bagtas and Espie Bagtas accompanied by the very cute Euri Bagtas. The sculpture is part of the series for upcoming one-man show of Aris Bagtas on November 19, 2015 at Art Asia SM Megamall, Mandaluyong City. Among the series of sculpture, my son Jewel and my daughter Joshua Yvette picked this Balangay among the very amazing pieces. This surprise gift really made my birthday! Thank you very much!